We've been compiling some amazing Porsche models on eBay for three years now, and we've seen some pretty astonishing examples pop up now and again. This week we're focusing on some of the more budget friendly aircooled alternatives. With winter upon us, it's time to hook yourself up with a new project car and spend some cold nights under a Porsche. Hopefully you've enjoyed our curated look at the Porsche market. Keep in mind, some of these Porsches could be great collection investments, while others might prove to do more financial harm than good. I'm not normally one to advise people to purchase mid-year narrow-body 911s, but when they're painted in beautiful and rare colors and are decently priced it's hard to disagree that they have their place in the enthusiast community. I love ice green metallic paint, and this car has clearly had a lot of work done to keep it looking and running nice. The engine has been rebuilt recently, which assuages any worries about head stud issues. The exhaust has been replaced with a stainless steel heat exchanger system, which deletes the thermal reactor problems these cars suffered from as new. And it's got a heavy duty oil cooler for good measure. It's been converted to carburetors, however, which means it's not going to pass an emissions check any time soon. And if I bought this, those Boxster wheels would be the first things to go. A good set of cookie cutters would be choice. Oh boy, where do we start with this one. If you're confident in your abilities to do bodywork, this could be a great project car for you. This 912 has allegedly received an engine rebuild and the transmission was checked internally in recent service receipts. That bodes well for the mechanical condition of this car. But that 80s-tastic widebody, quarter panel vents, and rocker covers just all have to be chucked in the trash. Find a nice correct decklid, redo the chrome on the sugar scoop headlight surrounds, and replace the fender flares with correct narrow bodywork and you're golden. Luckily the interior appears to be pretty nice, too. With a stated reserve price of $20,000, this 912 will need probably at least another ten to fifteen in body work. Is it worth that when it's done? Maybe. This 914 is a bit rough around the edges, and certainly needs some help to get back to good again, but if you're willing to put in the elbow grease, it'll reward you with awesome handling. This car is stated to have a bit of rust in the trunk, which means it has a bit of rust in other places, too. The engine is said to run, but the seller has not made any attempt to drive the car. With luck, you could perhaps drive the car home after a quick once-over. If you have access to a welder and a heaping helping of patience, this charcoal briquette could one day be polished into a diamond. Luckily, its cheap. 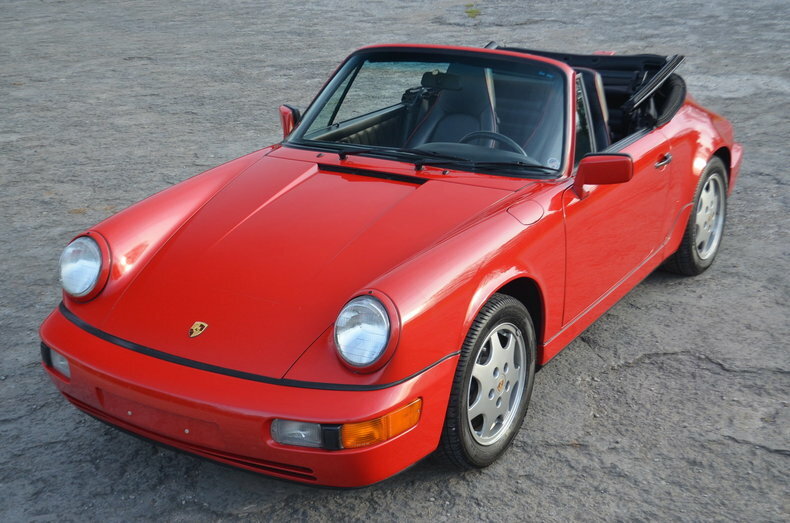 Unlike the others listed thus far, this 911 Cabriolet doesn't appear to need much of anything. It's also priced accordingly. 964s have exploded in value lately, and don't show any signs of stopping. This tiptronic Cabriolet might be one of the last examples under the $40,000 threshold however. If you are looking for a project, you could easily source a manual transmission and perform the swap yourself. It's a great platform for enthusiasts and weekend warriors, but that tiptronic is definitely not worth dealing with. This 912 has already had all of the heavy lifting done. With a 2.4-liter swap, this is probably the easiest and least expensive way to experience long-nose 911 driving pleasure. The work appears to be well done, and the parts used are certainly quality, in addition to being aesthetically pleasing. This is a simple and well done outlaw that could be your new canyon carving masterpiece. It's a very interesting piece of aircooled that will instantly earn you a lot of street cred with the Luftgekuhlt clan for a good bit less than most of them have paid in recent years.